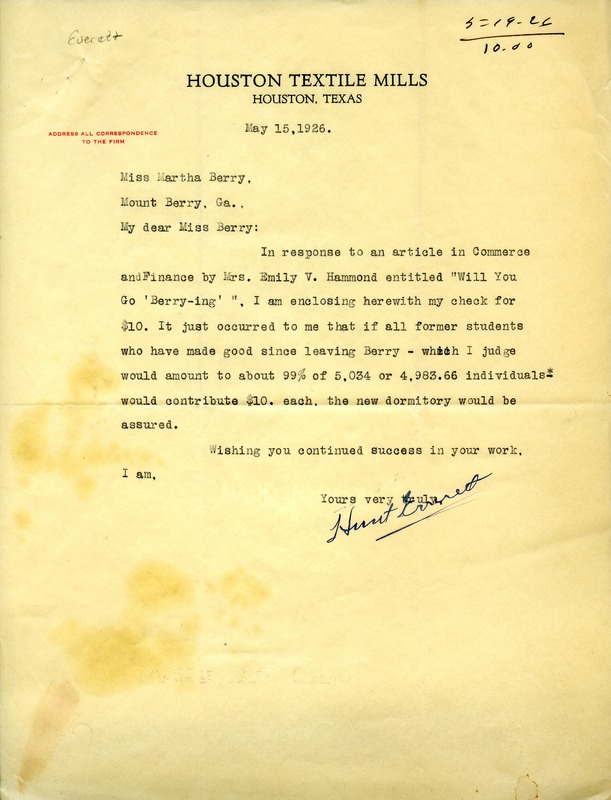 In this letter Mr. Everett donates ten dollars to Berry after reading " Will you Go Berry-ing" by Emily Vanderbilt Hammond. He also says that if every alumi that has done well donates ten dollars the new domritory would be assured. Hunt Everett, “Letter to Martha Berry from Hunt Everett.” Martha Berry Digital Archive. Eds. Schlitz, Stephanie A., Chloe Lombard, Sherre Harrington, Jordan Brannen, et al. Mount Berry: Berry College, 2012. accessed April 26, 2019, https://mbda.berry.edu/items/show/1381.